According to the National Demographic and Health Survey (2007) only 53% of Filipinos have coverage under PhilHealth or the National Health Insurance Program (NIHP). IPD research shows that of these, only half are able to use their PhilHealth card and get the benefits. 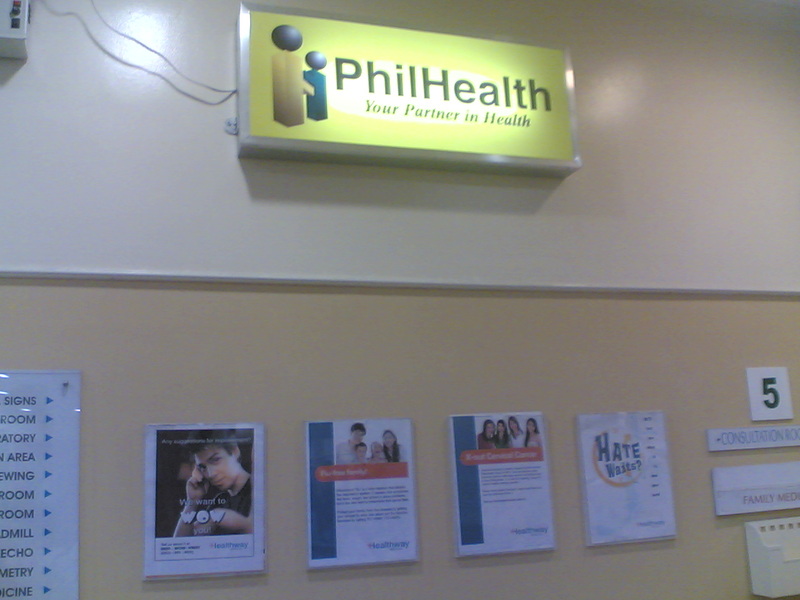 Only 34% of their hospitalization expenses are being covered by PhilHealth. Therefore, only 7.7% of hospitalization/medical expenses of Filipinos is being covered by PhilHealth. ...PhilHealth does not yet cover mid-way care for chronic diseases and other illnesses that are potentially fatal without mid-way care, such as hypertension, diabetes, HIV, colon cancer, asthma, and stroke. PhilHealth benefits package should cover these. Maintenance drugs for hypertension, monitoring for diabetes, anti-retroviral drugs for HIV, and physical therapy for stroke victims should also be included. Home visits for the aged, pregnants for pre- and neonatal care and birth planning, and undernourished children are among the items that should further be included under a more inclusive health insurance program for all Filipinos. 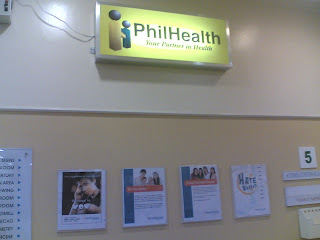 Yes, right now, PhilHealth does not cover (a) outpatient services, (b) dental services, what else. Philhealth is very strict in collecting contributions, one should have paid at least 9 months straight, etc. Before one can possibly file for any claims. But when one claims for reimbursement, he will wait for at least 60 working days, or almost 3 months including weekends and holidays, even if the proposed claim is as low as P1,000. My physician friend says that he gets paid about 4 months delayed. The hospital where he works may be filing their fees rather late, but the bulk of the delay lies on PhilHealth. He also observed that during election period, physicians are paid even much later. Doctor Alberto Romualdez, former DOH Secretary, observed that of the top 10 hospitals in terms of volume of claims from PhilHealth, 9 are private hospitals, only 1 is government hospital. One way to look at this is that PhilHealth in effect is paying more to the rich and middle class patients, not to the poor. Well, government hospitals do not provide drugs. Patients (or their caretakers) have to buy their drugs outside the hospital. Private hospitals have their own pharmacies, and patients' total bill include the cost of drugs, where PhilHealth will make reimbursements. Right now, there are other sectors that provide outpatient health insurance: local governments, cooperative or community health insurance, private health maintenance organizations (HMOs). Instead of PhilHealth covering outpatient and other expanded services then slapping us members with even higher mandatory monthly contributions, we better allow the other healthcare providers more leeway. The last time I was hospitalized was about 27 yrs ago, when I was still in the university. Since I graduated and have work, I've been paying for Medicare, then PhilHealth, zero benefit for me. I have a private health insurance card in our office, that one is very useful. I use it every year -- for annual general check up (not covered in Philhealth), for outpatient consultations and diagnostic tests like if I have a bad cough or bad fever. I see the value of my money in the privae health card. I surrender to the fact that I have to part with my money every month for the mandatory PhilHealth contribution, but they should not make such contributions even bigger. Remember, from our monthly paychecks, there are plenty of mandatory deducations already -- personal income tax, Pag-IBIG fund (housing contribution), SSS fund (pension and other services contribution), PhilHealth, what else. For every increase in any of those mandatory deductions, our monthly take home pay becomes smaller and smaller. And to think that when we spend such take home pay, the government still collects another round of taxes like VAT. There are many PhilHealth inefficiencies despite limjited coverage. Expanding the coverage will most likely expand the inefficiencies. PhilHealth -- like DPWH, DND, DepEd, DENR, etc. -- is a monster national bureaucracy. Monsters have a tendency to exist for themselves. That is why I don't trust them. To get sick is among the most difficult things to happen in a family. Depending on the seriousness of the disease, a household which has no health insurance coverage for family members will encounter mental and financial anguish. This is why having a health insurance is an important consideration for many households. The $2/person/year is definitely not enough. Two foreign aid programs, the Partners in Health (a health charity based in Boston), and The Global Fund, provide the bulk of health subsidies. The former said its own costs ran $28 per person per year in areas it serves, and it estimated that the government’s no-frills care costs $10 to $20. The problem with this scheme, however, is that price differentiation and market segmentation is not practiced. A millionaire and a jobless man both pay only $2/person/year. Such ridiculous pricing is one reason why government should step back a bit in healthcare. Those who are rich should be encouraged to get out of socialized healthcare system by allowing a healthy competition among private and cooperative health medical organizations. Since there is a long line for patients going to government health centers, the rich will voluntarily opt out and go to their private health insurance for quick treatment. The really poor should get the bulk of subsidy. And those who are irresponsible about their body, rich and poor alike, should get a second and supplementary private health insurance. The huge cost of treating someone with lung cancer due to over-smoking, or someone with liver cancer due to over-drinking, or someone with diabetis or hypertension due to over-eating fatty foods and having sedentary lifestyle, should not be borne by everyone. Let those patients, their families and friends, pay for the extra costs of not taking care of one’s body. This is one way of making people be more conscious and be more responsible about their body. And this is one way of reducing corruption in government too, as there will be less tax money that will be available for sometimes arbitrary spending. Health insurance indeed, should not be a monopoly of government, either by the national (through PhilHealth) or local governments. For countries with weak promulgation of the rule of law, where there is monopoly, there is huge waste and robbery. The incoming administration should prioritize further deregulating the private and cooperative type of health insurance sector. Where there are plenty of competitors, each player will be forced to provide better quality services at lower or competitive cost to the public. Of course, there will be opportunist and unethical providers among those competitors. And this is where the government will come in more effectively: to enforce the rule of law, that private players and enterprises should stick to their avowed goal of providing services to the public without compromising on quality and ensuring the safety of the patients. You are right sir.I believe you. A good review of the agency's process is very much needed. Philhealth must operate like a real private business organization and insurance system, so sense of URGENCY will be pushed a VALUE in its operation which must be imbibed by all Philhealth employees supposed to be there to serve.